AAA Academically and professionally qualified B/​G age 48,​5’2” attractive much younger looking pretty fair slim kind-hearted nature lover daughter marriage delayed due to family responsibilities seeks Govigama caste Christ/​Buddhist trusted partner age below 56 from Colombo suburbs with equal status. MBBS Doctors/​Uni. Lecturers specially considered. Please write with genuine details with permanent address TP number and the horoscope. Academically and professionally qualified partner is sought for 41 year MBBS Doctor in Colombo suburbs. Academically and professionally qualified partner,​sought by B/​G parents for their pretty fair young looking (49) BSc,​PD in (Edu) Chemistry teacher. Academically and professionally qualified, employed, well mannered caring son is sought by G/B parents from Colombo suburbs for their pretty, well mannered, educated daughter who is employed, as a Chemist in a company born in December 1988, 5’4” She is graduated in Chemistry and MSc degree in Food Science. Please reply with horoscope. Born in 1987 Feb academically qualified upto a Master’s Degree from an Australian University. She is 5’3” in height fair and pretty B/​G parents from Western Province seeking for a well mannered son age no more than 36,​please reply non malefic horoscope only to p​r​o​p​o​s​a​l​0​2​8​7​@​g​m​a​i​l​.​c​o​m​with contact numbers. B/​G Colombo,​ordinary family parents seek a well mannered son,​PhD qualified or has similar academic qualifications,​for their daughter,​born 1985,​5’3”,​PhD in Bio Science,​employed in America as Research Scientist. No adverse planetary showing in the horoscope. B/​G educated parents from Kandy seek a professionally qualified son for daughter born in 1987,​5’2”,​working at a reputed University in USA. Reply with horoscope and family details. p​a​l​a​k​a​t​i​g​a​m​a​g​e​@​g​m​a​i​l​.​c​o​m​(TL : 0812310032). 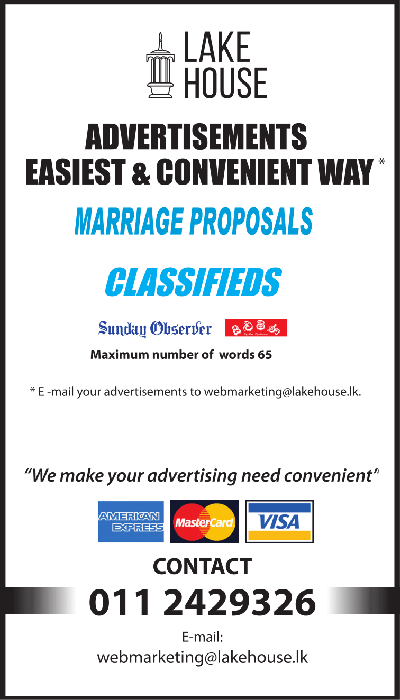 B/​G retired professional parents from Colombo suburbs seek academically & professionally qualified well-mannered son of similar status for their 48 yrs old daughter 5’5” good looking,​English educated,​BSc graduate studied in reputed Buddhist girls’ school. At present she is working as a government nursing lecturer. She inherits properties including a car. Catholic Sinhala/​Govigama parents seek a qualified employed partner with sober habits for their Convent educated,​fair,​slim,​35 years old daughter,​attached to an international school. She will receive a substantial dowry. Email: s​m​t​6​5​7​8​@​g​m​a​i​l​.​c​o​m​0112237460. Govi /​Buddhist Doctor parents in UK seeking a partner for daughter. She is a doctor in Specialist training in the NHS working in London pretty fair 5’5” tall born in July 1985 She loves music and studied the piano Educated both in Sri Lanka and UK elder sister is a doctor married and working in London younger brother is an Engineer employed in London. We have plenty of family connections in Sri lanka and hold dual nationality Please contact email b​n​j​a​y​a​1​@​y​a​h​o​o​.​c​o​.​u​k​Phone +447947695630. Kandyan Govi Buddhist 1993 September 5’1” fair daughter presently BSc (Molecular Biology and Bio Chemistry) final year under graduate in government university. We seek educated very pleasent son under 30 years working/ studying in Sri Lanka or abroad same as science field. Her younger sister under graduate in MBBS. Shanny 7. Please reply with horoscope and family details. Kandy Bodu/​Govi mother seeks kind respectable partner for her daughter 33 years,​5’2’’,​tan complexion qualified in industrial bakery field. Kuja 1,​2,​4,​7,​8 preferred. m​p​r​o​p​5​6​@​g​m​a​i​l​.​c​o​m​081-2241356. Moor parents from Kandy seeks partner for pretty daughter slim fair tall 5’4” age 29yrs. Educated in a reputed school in Kandy. Owns a lovely house in Kandy. A suitable partner working in public or private sector with a moderate income or businessman will be considered. Parents living in Australia seek a professionally qualified partner with sober habits for their 36 year old daughter,​raised and educated in Australia,​5’4” tall,​academically qualified (PhD) presently working in London. She is a dual citizen of Australia and UK. Please respond with details to: p​r​o​p​o​s​a​l​u​k​2​0​1​7​@​o​u​t​l​o​o​k​.​c​o​m​. Available to meet potential suitors between 22nd Dec. 2018 & 4th Jan. 2019 in SL. S/​B parents living in Austria seeking professionally qualified son age between 28 and 32,​brought up with Sri Lankan values for their daughter completed BSc (Architecture) and currently reading for her MSc,​she is the eldest born in 1991 5’3” in height,​brought up with Sri Lankan values. Please reply with details,​birthday,​birth time and place of birth (horoscope) Email: m​a​i​l​_​a​n​f​u​t​u​r​e​@​g​m​x​.​a​t​(Those who live in abroad is favoured).